What to do in the New York City? There’s simply no place like the Big Apple. Home to more than eight million people from every corner of the world, it the global center for luxury travel, business, finance, the arts, entertainment, sports, fashion and politics. Explore the sights and sounds of this international metropolis from your exquisite accommodations at Sofitel New York — an ideal luxury location in the midst of it all — perfect for your business travel or vacation stay. Harlem’s acclaimed Apollo Theater is important not only because it honors and promotes the contributions of black performers but also because it is a living example of progress: the building was originally a burlesque theater. The theater shut down in 1933 after future New York City mayor Fiorello La Guardia launched an anti-burlesque campaign. Reopened under new management in 1934, the Apollo began to direct programming toward Harlem’s burgeoning African-American community. Barclays Center is a multi-purpose indoor arena in the New York City borough of Brooklyn. The arena is home to the Brooklyn Nets of the National Basketball Association, and the arena also hosts concerts, conventions and other sporting and entertainment events. No visit to the cultural capital of the world is complete without experiencing the thrill of a Broadway show. 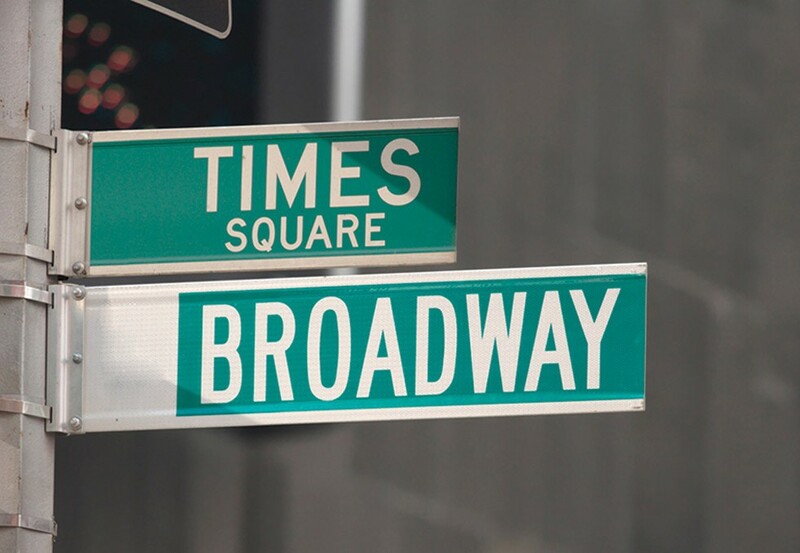 Just a short walk from Manhattan’s Great White Way in the heart of the Theater District, Sofitel New York – a model of drama and sophistication in its own right – provides easy access to Broadway’s top performing artists, longest running musicals and the hottest new shows 24/7. After all, it is the city that never sleeps. The Bronx Zoo of the Wildlife Conservation Society is the premier place to study and appreciate the world’s many creatures. Home to more than 6,000 animals, the zoo spans 265 acres that re-create the diverse natural habitats of its numerous residents. Open year-round, it’s a great experience in any season. During the winter, be sure to stop by Tiger Mountain or Himalayan Highlands to see big cats enjoying the chilly outdoors—then head to World of Reptiles or JungleWorld for a warm up with tropical wildlife. (Some exhibits and attractions are seasonal. Go to BronxZoo.com to plan your visit in advance.). Brookfield Place is the height of luxury shopping, dining and cultural arts in downtown Manhattan. The complex is positioned just south of Tribeca along the Hudson River waterfront and home to international fashion houses including Hermès, Bottega Veneta and Burberry, and contemporary brands such as Paul Smith, Theory, Michael Kors, Vince and Lululemon. An 85,000-square-foot Saks Fifth Avenue opened in 2016. Best-in-class dining options include Hudson Eats, a collection of 14 chef-driven eateries; Le District, a 30,000-square-foot French-inspired marketplace; and eight signature restaurants including Del Frisco’s Grille and Parm. Tour the many specialty gardens within Brooklyn Botanic Garden: Enjoy the serenity of the Japanese Hill-and-Pond Garden; take in the fragrant Cranford Rose Garden; and visit the exotic collections of the Steinhardt Conservatory, including the famous C.V. Starr Bonsai Museum. The blossoming of Brooklyn Botanic Garden’s 200 cherry trees is a New York City rite of spring and not to be missed. Stretching across the East River, the iconic Brooklyn Bridge opened up back in 1883 to carry traffic (nonautomotive at the time) between Lower Manhattan and Brooklyn. One of the most recognizable parts of the New York City skyline, the bridge has been featured in movies and on television shows, and is a real piece of New York City history. 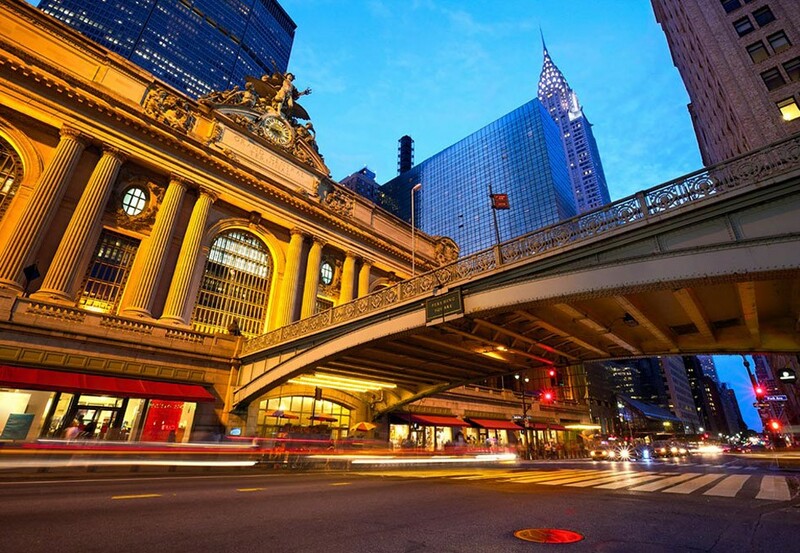 A stroll across the elevated pedestrian walkway provides a true New York City experience. The Manhattan-side entrance is at Park Row and Centre Street, across from City Hall Park, east of City Hall; over on the Brooklyn side, enter at Cadman Plaza East or where Boerum Place meets Tillary Street. Find 100 vendors from the Flea selling furniture, housewares, vintage clothing, antiques and collectibles, jewelry, art, and crafts; plus, 40 Smorgasburg vendors serving up cooked and packaged foods. The indoor Winter Flea market is open every Saturday and Sunday November through March, while in warmer months the Flea moves outdoors. April through October, you’ll find it at the Williamsburg Hotel on Saturdays and at the Manhattan Bridge Archway on Sundays. Chelsea Market is a food hall, shopping mall, office building and television production facility located in the Chelsea neighborhood of the borough of Manhattan, in New York City. The Chelsea Market complex occupies an entire city block with a connecting bridge over Tenth Avenue to the adjacent 85 Tenth Avenue building. The High Line passes through the 10th Avenue side of the building. Manhattan’s Chinatown is a neighborhood in Lower Manhattan, New York City, bordering the Lower East Side to its east, Little Italy to its north, Civic Center to its south, and Tribeca to its west. The Chrysler Building is an Art Deco–style skyscraper located on the East Side of Midtown Manhattan in New York City, at the intersection of 42nd Street and Lexington Avenue in the Turtle Bay neighborhood of Manhattan. At 1,046 feet (318.9 m), the structure was the world’s tallest building for 11 months before it was surpassed by the Empire State Building in 1931. It is the tallest brick building in the world with a steel framework. As of 2018, the Chrysler is the eighth-tallest building in the city, tied with The New York Times Building. Columbus Circle is a traffic circle and heavily trafficked intersection in the New York City borough of Manhattan, located at the intersection of Eighth Avenue, Broadway, Central Park South (West 59th Street), and Central Park West, at the southwest corner of Central Park. The circle is the point from which official highway distances from New York City are measured. The circle is named after the monument of Christopher Columbus in the center, which is listed on the National Register of Historic Places. The name is also used for the neighborhood that surrounds the circle for a few blocks in each direction. To the southwest of the circle lies Hell’s Kitchen (also known as “Clinton”), to the southeast is the Theater District, and to the north is the Upper West Side. TheConey Island Cyclone (better known as simply the Cyclone) is a historic wooden roller coaster in the Coney Island section of Brooklyn, New York City. It opened on June 26, 1927, and was originally part of the Astroland theme park. The Cyclone is now part of Luna Park. The coaster was declared a New York City landmark on July 12, 1988, and was placed on the National Register of Historic Places on June 26, 1991. Soaring 1,454 feet above Midtown Manhattan from base to antenna, the Empire State Building is one of the world’s most famous skyscrapers. Its 86th and 102nd floor Observation Decks, open daily from 8am–2am, offer two of the highest vantage points in the City. On a clear day, you can see New York, New Jersey, Pennsylvania, Connecticut and Massachusetts. Explore the newly-designed entrance featuring a grand staircase with a two-story architectural model of the building, multilingual signage and ticket kiosks in 9 languages, a new lighting ceremony space with images of past celebrity visitors, and a red carpet for VIP guests. The Flatiron Building, originally the Fuller Building, is a triangular 22-story, 285-foot (86.9 m) tall steel-framed landmarked building located at 175 Fifth Avenue in the Flatiron District neighborhood of borough of Manhattan, New York City. Upon completion in 1902, it was one of the tallest buildings in the city at 20 floors high and one of only two “skyscrapers” north of 14th Street – the other being the Metropolitan Life Insurance Company Tower, one block east. The building sits on a triangular block formed by Fifth Avenue, Broadway, and East 22nd Street – where the building’s 87-foot (27 m) back end is located – with East 23rd Street grazing the triangle’s northern (uptown) peak. As with numerous other wedge-shaped buildings, the name “Flatiron” derives from its resemblance to a cast-iron clothes iron. Flushing Meadows–Corona Park, often referred to as Flushing Meadows Park, or simply Flushing Meadows, is a public park in the northern part of Queens, New York City. It contains the USTA Billie Jean King National Tennis Center, the current venue for the US Open tennis tournament; Citi Field, the home of the New York Mets baseball team; the New York Hall of Science; the Queens Museum of Art; the Queens Theatre in the Park; the Queens Zoo; and the New York State Pavilion. It formerly contained Shea Stadium, demolished in 2009. Governors Island is a 172-acre (70 ha) island in New York Harbor, approximately 800 yards (732 m) from the southern tip of Manhattan Island and separated from Brooklyn by Buttermilk Channel, approximately 400 yards (366 m). It is part of the borough of Manhattan in New York City. The National Park Service administers a small portion of the north of the island as the Governors Island National Monument, while the Trust for Governors Island operates the remaining 150 acres, including 52 historic buildings. Today, Governors Island is a popular seasonal destination open to the public between May and September with a 43-acre public park completed between 2012 and 2016, free arts and cultural events, and recreational activities. The island is accessed by ferries from Brooklyn and Manhattan. The Lenape of the Manhattan region referred to the island as Paggank (“nut island”), likely after the island’s plentiful hickory, oak, and chestnut trees; the Dutch explorer Adriaen Block called it Noten Eylant, a translation, and this was borrowed into English as Nutten Island. The island’s current name, made official in 1784, stems from the British colonial era, when the colonial assembly reserved the island for the exclusive use of New York’s royal governors. World’s largest performing arts center offers opera, ballet, chamber music, jazz, theater and more. Home to the Metropolitan Opera, David H. Koch Theater, David Geffen Hall (formerly Avery Fisher). Annual series include Great Performers, American Songbook, Mostly Mozart, Midsummer Night Swing. Guided tours available. Lincoln Center provides groups with a range of opportunities from intimate performances and conversations with artists to group sales tickets and guided tours. Kid/adult/corporate friendly. Located on bustling 34th Street, the world’s largest department store can seem like a universe all its own. With over a million square feet of space for merchandise, the ten floors offer practically everything you could want—cosmetics and fragrance, handbags, ties, shoes and much more—attracting thousands of tourists and locals who pass through its revolving doors daily. Macy’s recent renovation has added new offerings including Stella 34, a full service trattoria, and luxury shops from Louis Vuitton, Gucci, Burberry and Longchamps. There is no other arena in the nation filled with the spirit of so many legends; iconic athletes, chart-topping musicians, celebrated performers, and even presidents and popes are all part of its legacy. As “The World’s Most Famous Arena,” there’s no debating that championship history happens here in the greatest city in the world. Beyond the main 19,500-seat venue, Madison Square Garden offers a variety of state-of-the-art spaces to accommodate special events. Paintings, sculpture, drawings, prints, architecture, design, photography, films, media, and performance art from 1880s to present. Admission. Audio guides in nine languages, free with admission. Bookstore, gift shop, restaurant, cafés. Open seven days. Function rooms, 11; capacity 50–400 theater, 60–1,100 banquet, 100–2,500 cocktails. Center for cutting-edge contemporary art housed in a converted school building. Landmark Beaux-Arts building houses one of the world’s great research centers and collections. Changing exhibitions. Gift shop. Free. Function rooms, 8; capacity 177 theater, 44–425 banquet, 60–750 cocktails. The nation’s largest bus terminal is composed of two multilevel terminal wings. Provides connecting bus service to virtually any point in the continental United States. Special options for the hearing impaired. Prospect Park is a 526-acre (213 ha) public park in the New York City borough of Brooklyn. Prospect Park is run and operated by the Prospect Park Alliance and the New York City Department of Parks and Recreation (NYC Parks). The park is situated between the neighborhoods of Park Slope, Prospect Heights, Prospect Lefferts Gardens, Flatbush, and Windsor Terrace, and is adjacent to the Brooklyn Museum, Grand Army Plaza, and the Brooklyn Botanic Garden. It is part of the Brooklyn-Queens Greenway, and is the second largest public park in Brooklyn, behind Marine Park. Changing exhibits of 20th-century art. Films, talks, lectures, family programs. Panorama of New York City, Tiffany lamps. Large, medium and small event spaces include those with stunning views of the Unisphere, 85-seat theater, gallery spaces. Admission. Closed Mon., Tues. Function rooms, 4; capacity 85 theater, 100–600 banquet, 1,200 cocktails, 550 classroom. The Landmark property consists of approximately 8 million square feet in ten Art Deco buildings with unique, internationally recognized architectural features, over 100 major artworks. Enjoy a stroll through Rockefeller Center, which offers a pleasantly surprising variety of stores to shop at, from Kenneth Cole to La Maison Du Chocolate. Set in the East River with sweeping views of Manhattan’s East Side, this residential community that once was the location for prisons, poor houses and hospitals now offers a mix of parks and several landmarks. The Tram, the main transportation to the island and the only commuter cable car in North America, glides over the East River with the Manhattan skyline as a backdrop. The Western Promenade provides a peaceful setting to view maritime traffic. Blackwell House, a 1796 farmhouse, serves as a visitors’ center. At the southern tip is Southpoint Park, site of Franklin D. Roosevelt Four Freedoms Park, while nearby is the Renwick Ruin, what’s left of an 1854 smallpox hospital, as well as the Strecker Laboratory (1892). The Octagon Tower (1843) was once part of a lunatic asylum chronicled by Nellie Bly and Charles Dickens, and the Chapel of the Good Shepherd (1888) is now the island’s community center. In a park at the northern end of the island stands the Lighthouse (1872). Smorgasburg is the largest weekly open-air food market in America, attracting 20,000-30,000 people to Brooklyn each weekend to eat from 100 local vendors. Frank Lloyd Wright landmark featuring modern and contemporary art, plus special exhibitions. Free guided exhibition tours and audio guide. Discounts for groups 10+, after-hours rates, multilingual guides, tour and dining packages, space rentals. Exclusive private viewings for tour groups. Unique spaces available to corporate members for special events. Admission. Closed Thurs. Function rooms, 5; capacity 280 theater, 230 banquet, 1,000 cocktails. It features some of the oldest architecture in downtown Manhattan, and includes the largest concentration of restored early 19th-century commercial buildings in the city. This includes renovated original mercantile buildings, renovated sailing ships, the former Fulton Fish Market, and modern tourist malls featuring food, shopping, and nightlife. St. Patrick’s Cathedral is the Mother Church of the Archdiocese of New York and the seat of the Archbishop. Located on Fifth Avenue, across from Rockefeller Center, the sanctuary is the largest Gothic Catholic cathedral in the US. This international landmark, dedicated in 1879, welcomes more than five million visitors each year. With its 330-foot spires, it is one of the City’s most spectacular architectural sights. Inside, it boasts a seating capacity of 2,400, numerous altars and stained glass windows, and a giant organ with 7,855 pipes. Services are held daily and all are welcome, visitors and worshipers alike. Download the self-guided audio tour app. A national tribute of remembrance and honor to the men, women, and children killed in the terror attacks of September 11, 2001 and February 26, 1993. Displays monumental artifacts associated with 9/11, while presenting intimate stories of loss, compassion, reckoning and recovery, central to telling the story of the 2001 attacks and the aftermath. Admission for museum (advance purchase strongly recommended); memorial is free. The High Line is a 1.45-mile-long (2.33 km) elevated linear park, greenway and rail trail created on a former New York Central Railroad spur on the west side of Manhattan in New York City. The High Line’s design is a collaboration between James Corner Field Operations (Project Lead), Diller Scofidio + Renfro, and Piet Oudolf. The abandoned spur has been redesigned as a “living system” drawing from multiple disciplines which include landscape architecture, urban design, and ecology. Since opening in 2009, the High Line has become an icon of contemporary landscape architecture. The Statue of Liberty is among New York City’s—and America’s—most familiar landmarks: a massive copper-and-steel cast of a green lady raising a torch, clutching a tablet and donning a seven-point crown. Some tourists miss out on visiting the statue because it’s only accessible by boat, set on a government-run island in the middle of New York Harbor, but it’s easy to work into your trip with some advance planning. The monument welcomed generations of immigrants to the United States as they passed through nearby Ellis Island, the nation’s main entry station between 1892 and 1924 (it eventually closed in 1954). Its American Family Immigration History Center contains millions of passenger arrival records and hundreds of ship pictures from the time; anyone whose family arrived in America this way, or who has just a passing interest in the nation’s immigrant history, will find the museum an excellent bonus to a statue trip—or a reason to visit in its own right. New York City’s Theatre District is an area in Midtown Manhattan where most Broadway theaters are located, as well as many other theaters, movie theaters, restaurants, hotels, and other places of entertainment. 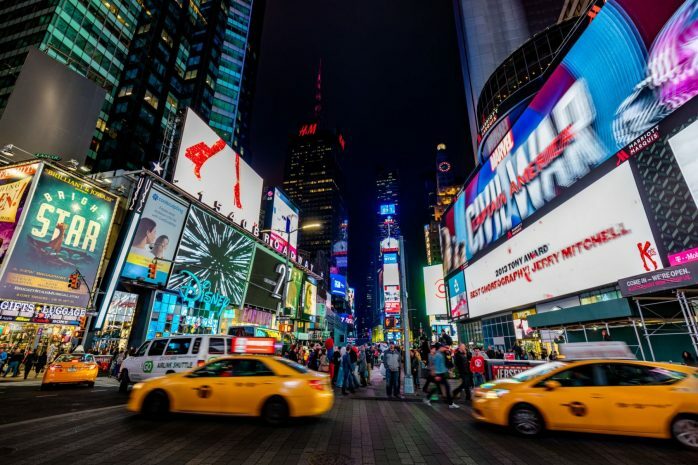 It is bounded by West 40th Street on the south, West 54th Street on the north, Sixth Avenue on the east and Eighth Avenue on the west, and includes Times Square. 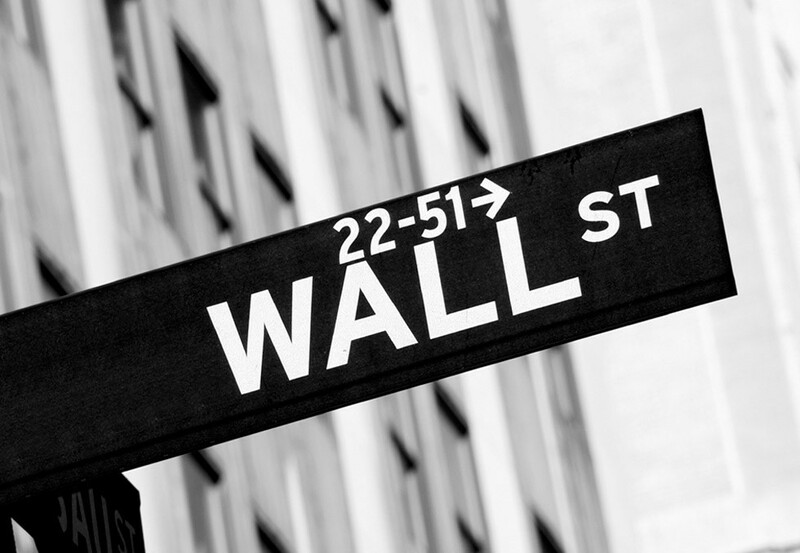 The Great White Way is the name given to the section of Broadway which runs through the Theater District. Union Square is a historic intersection and surrounding neighborhood in Manhattan, New York City, located where Broadway and the former Bowery Road – now Fourth Avenue – came together in the early 19th century; its name denotes that “here was the union of the two principal thoroughfares of the island”. The symbolic heart of Greenwich Village, Washington Square Park is one of NYC’s most recognizable public spaces. Pass beneath the Washington Arch—the giant structure marking the park’s Fifth Avenue entrance on the north side—and you’ll see the energy that makes the place so special. NYU students congregate around a central fountain; sunbathers lie on the lawn; musicians sit on benches strumming guitars; and canines run gleefully amok in two dog runs. The park’s black-brick paths and vintage-style streetlights lend it a 19th-century feel, as does a majestic bronze statue of Garibaldi. The Whitney Museum of American Art is the world’s leading museum of 20th-century and contemporary art of the United States. Focusing particularly on works by living artists, the Whitney is celebrated for presenting important exhibitions and for its renowned collection, which comprises over 21,000 works by more than 3,000 artists. With a history of exhibiting the most promising and influential artists and provoking intense debate, the Whitney Biennial, the museum’s signature exhibition, has become the most important survey of the state of contemporary art in the United States. 230 FIFTH is New York’s largest outdoor Rooftop Garden and Fully enclosed Penthouse Lounge. One floor is fully enclosed. And our rooftop garden is open to the sky. We do have large umbrellas for those sunny or rainy days and is partially heated on colder nights. Please make sure to send an email to our concierge team at sny.concierge@sofitel.com, prior or during your stay, they will be able to assist you with all your questions and as well to help you book all your actiivities.